Solitude, reflection on identity and the study of the space that we occupy in the world are at the centre of the double exhibition SOLILOQUY, which runs from October 6th until November 10th.The protagonists, both foreigners, are two of the artists most loved by the PUNTO SULL’ARTE public: the Chilean painter FEDERICO INFANTE and the Swedish sculptor JOHANNES NIELSEN. OPENING SATURDAY 6th OCTOBER 2018 H 6pm-9pm. In respect to his previous show, Infante seems here to have carried the dichotomy between the work’s central figure and the space that surrounds it to the extreme. Indeed, the backgrounds – executed with an original and profoundly instinctive technique – are more and more uncertain, sometimes covered with abstract, circular patterned symbols, while the figures crystallise into a detailed vision, well-defined, characterised evenbythe details of clothing. The latent sense of solitude remains intact, to the point of melancholiness, whether in the figures who turn their shoulders from us, or in those who face the front, assertive, but who deny us their gaze by lowering it or hiding it behind sunglasses. Also Nielsen brings his work’s most recent evolution to the exhibition, which moves from the investigation of man towards the experience of the body. 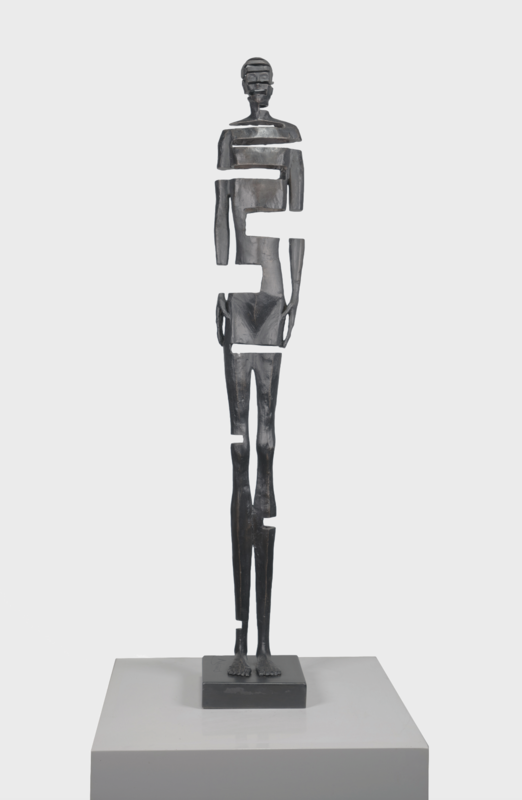 His spindly figures, reminiscent of Giacometti, are broken and recomposed in spatial games that recall Antony Gormley’s experimentations. Here then the figures are riddled with holes, that reveal missing parts as if they had been cancelled out with the stroke of an eraser; divided lengthwise into two as if separated by a sword blow. Or broken and rejoined contrarily, two opposing halves like Dr. Jekyll and Mr. Hyde or an individual broken in the incessant search for his identity and his role in the world.The exhibition is accompanied by a bilingual catalogue produced by PUNTO SULL’ARTE, containing the critical text by curator Alessandra Redaelli and reproductions of the exhibited works.The artists will be present at the opening.